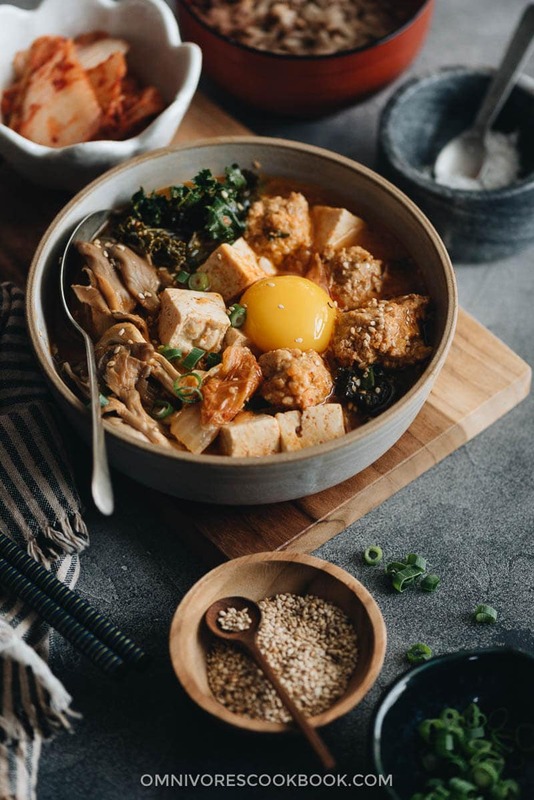 A scrumptious kimchi stew loaded with meatballs and veggies. Serve it with some steamed rice and you’ll have a one-pot dinner in no time. 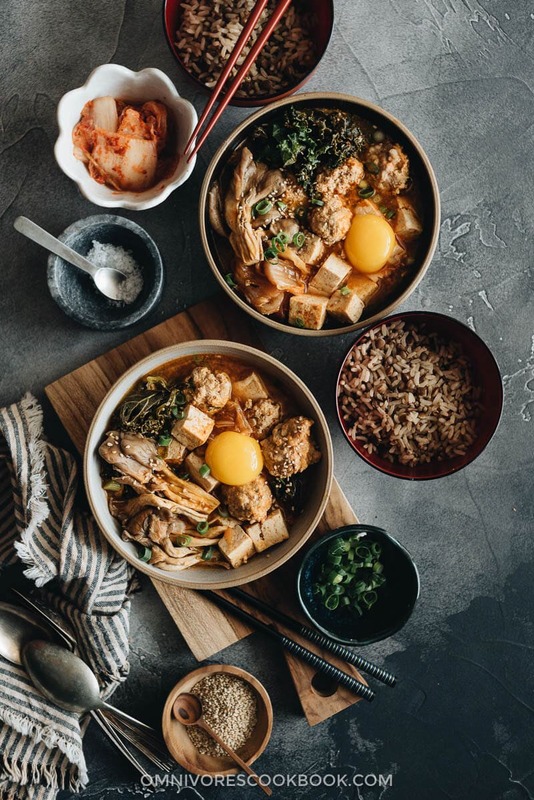 This kimchi stew is one of my favorite dishes for winter. It is super comforting, bold in flavor, and loaded with nutrition. I discovered kimchi stew when I was living in Japan, about 12 years ago. Back then, I was a rookie cook and I could barely make anything delicious. One day I discovered a Korean-style soup base at the grocery store. I followed the instructions on the back and made a one-pot dinner. It was SO GOOD that I devoured the whole batch in one sitting. 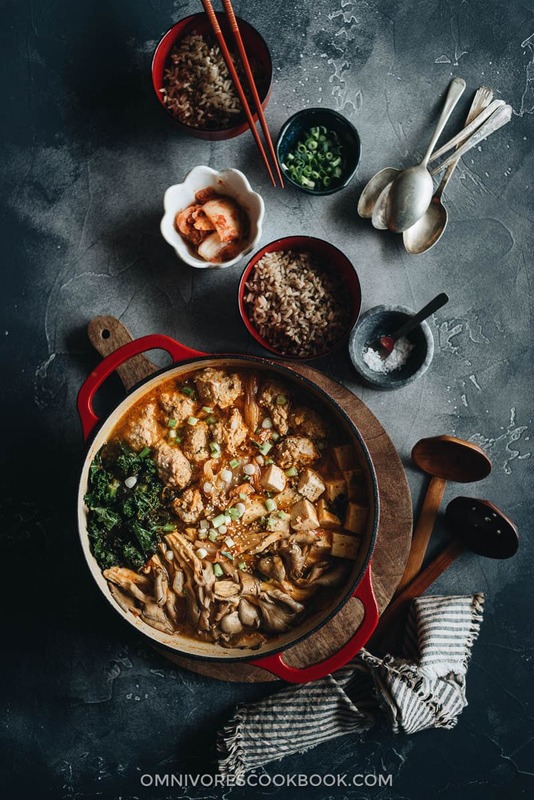 From that point, I always kept a few packs of soup base in the pantry, and would throw in random veggies and protein to whip up a quick, healthy, and hearty dinner for one. Later on, I realized it was so easy to make kimchi soup base at home. All need is a big jar of kimchi and some gochujang (Korean Hot Chili Paste). You can even get both of these on Amazon (shop kimchi here, and gochujang here). Once you get the basic ingredients ready, the cooking part is easy. All you need to do is stir fry tons of aromatics with the kimchi and gochujang to release their fragrance. Then you can throw in any veggies and protein you like. 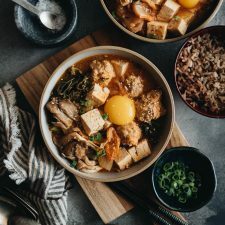 Although traditional kimchi stew often uses thinly sliced pork, I prefer to use ground pork to make these flavorful, juicy, and tender meatballs. The soup is somehow more fulfilling this way. We serve it as a main dish with steamed rice for dinner. It makes a cold winter day extra warm and cozy. Combine ground pork, ginger, Shaoxing wine, and soy sauce in a small bowl. Mix well and set aside at room temperature to marinate for 10 minutes. Add the breadcrumbs and egg. Fold until it forms a quite soft paste. Add a bit more breadcrumbs if the paste is too runny. Do not over-mix. Heat oil in a 3-quart pot over medium heat until hot. Add the garlic, ginger, and green onion. Stir a few times to release the fragrance. Add the Gochujang. Cook and stir for 1 minute, when the ingredients are evenly coated. Add the chicken stock, tofu, sugar, and salt. Cook over medium high heat until bringing to a boil. Turn to medium low heat and simmer for 5 minutes. Add the mushrooms and kale. Cook for 5 minutes. 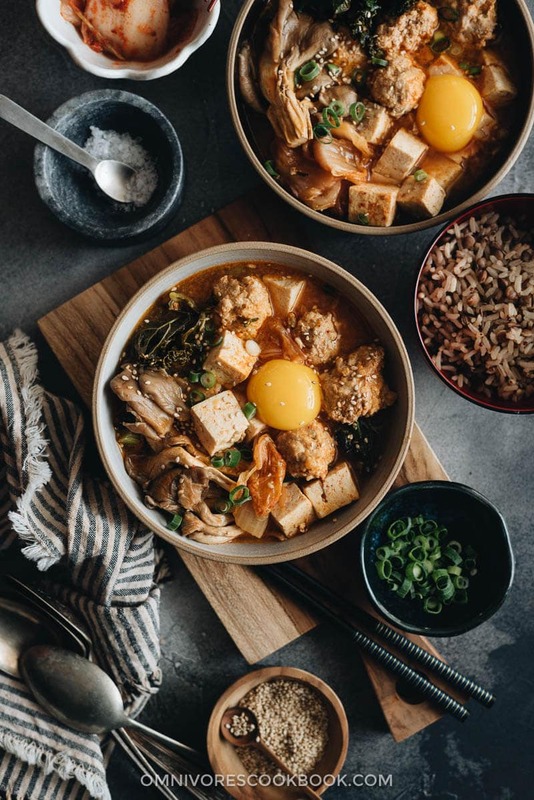 Use a medium-sized spoon or small cookie scoop to scoop the ground pork, shape it into a ball, and add it into the soup. Continue making the rest of the meatballs one at a time, in the same manner. Cover and simmer for about 5 minutes, or until the meatballs are cooked through but still very soft. You can take out a meatball and cut it to check whether it’s cooked. Remove the pot from the stove. Pour the stew into serving bowls and garnish with egg yolk, green onion, and sesame seeds, if using. Serve hot with steamed rice. The recipe was originally posted on Jan 12, 2014 and updated by Feb 24, 2018. Delicious! I love gochujang, and the enoki mushrooms have such a lovely texture in soups 🙂 Is there any substitute for the sake/wine though? I have rice vinegar, but I’m not sure if that will do. I don’t think you can use rice vinegar to replace sake or cooking wine. You need a dry and light alcohol for substitute. I never tried, but I think 1 tablespoon dry white wine, or 1 teaspoon vodka (or brandy) will work. The purpose of adding light alcohol is to soften the meat and eliminate stinkiness of the pork. If you don’t have any alcohol at all, replace sake with 2 tablespoons water, and add 1 teaspoon minced ginger instead of 1/2 teaspoon. You could also add 2 tablespoons minced green onion (or onion). Thanks for commenting and I’m so glad you like this one! Hi Maggie, I made this stew last week and served it with steamed brown rice. Such a delicous balance of flavours…uber umami! Thanks so much for the recipe.